This new comic book series is a spin-off from Marvel Comics latest Spider-Man event, Clone Conspiracy. I am coming off a year-long comic book reading hiatus, so I had to put myself back into the comics loop. 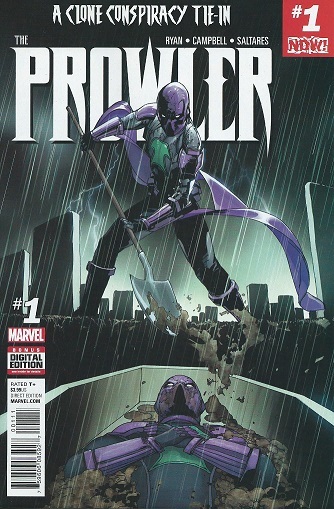 I chose Prowler #1 because of the story’s description and its attention-grabbing cover. I was instantly hooked after reading this debut issue. The Jackal has somehow conquered death and is back on the scene. He might also have discovered a way to achieve eternal life. Apparently Jackal has brought several characters, villains of course, back to life and is giving them a new beginning at New U. Previously killed by the “new” Electro, Prowler was also given a new life and fresh start thanks to Jackal and his cloning technology. Prowler works for Jackal as head of security to keep the villains in check. However, Prowler doesn’t like to be cooped up inside New U all the time so he occasionally slips out behind Jackal’s back to get some fresh air. In this issue, he takes off to thwart a robbery attempt. Not ready for his technology to be revealed, Jackal tells Prowler that he can’t come and go as he please. Then he sends Prowler on a mission to find the culprit that has been trying to hack into his systems. On his way to see Madame Web, also given a new life by Jackal, for information about the hacker(s), Prowler runs into Electro at New U. There was a heated exchange between the two and Electro asked Prowler if he knew why Jackal brought him back to life. Prowler continues on to his mission and all hell begins to break loose. Sean Ryan is the creative writer of this new comic book series. Phenomenal story set-up. Great dialogue and character interactions. Excellent character distinctions, especially Electro. Pacing is on target, the story is easy-to-follow. Great visuals by Javier Saltares and Jamal Campbell. No complaints at all in this area. I especially like Prowler’s costume, purple is my favorite color! Is the Jackal still a villain, or is a humanitarian now? Jackal asked Prowler if he took his medicine. Just what is this medicine he has to take on a daily basis? Is it for high blood pressure? Is it a psychotropic medication? Or is Prowler being kept alive by this medicine? What is Jackal up to and what is his motive for bringing Hobie Brown aka Prowler back to life and using him as head of security? These are questions I am excited about learning the answers to, therefore I definitely plan to read the next issue of The Prowler. At this point I don’t know if The Prowler, rated teens and above, is an ongoing series or miniseries. I haven’t had time to check into that piece just yet. The Prowler #1 was released on October 26, 2016. I highly recommend this title. It is an excellent jump on point for new and returning comic book readers. I give this debut issue 5/5 stars.